This page has been visited 06009 times since . Last update: 2018.08.14 (Tuesday) 15:35:02 EDT. For further information on what Göteborg has to offer, please visit the official web site of the city of Göteborg at http://www.goteborg.com/. 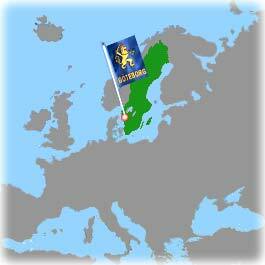 the Polar Circle in Sweden or Norway is only a 1-2 day trip (one-way) by car from Gothenburg? 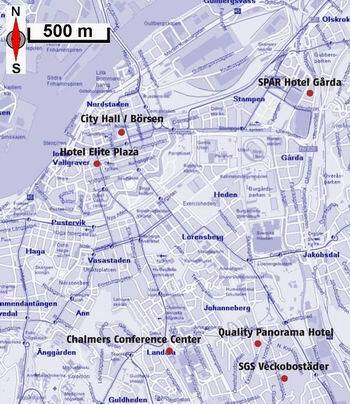 The venue for the Sixth International Conference on the Science and Application of Nanotubes, NT'05, is the Chalmers Conference Centre, and can be reached easily from both the Railway station and the International Göteborg Landvetter airport (airport code GOT). If you arrive by air, the Airport bus provides the cheapest connection from the Landvetter Airport to downtown Göteborg. You will need to change from the airport bus at Korsvägen to tram number 6 or 8, which takes you after one stop to Chalmers. There is also a convenient taxi service, with a special discounted fare to downtown Göteborg (the "fixed price" was SEK 320, about USD 50, in early 2004). Click also HERE for a map with the NT'05 and CCTN'05 venue. Click HERE for more information about accommodations. The weather may be sunny or rainy during the conference, with a pleasant temperature ranging between 15-25 degrees C. Due to the proximity to the Polar Circle and the time of the year, there are about 20 hours of daylight, and a 4-hour short night.